I wrote this post as a participant in the Eat, Play, Love blog carnival hosted by Meals Matterand Dairy Council of California to share ideas on positive and fun ways to teach children healthy eating habits. A list of other registered dietitians and moms who are participating in the carnival will be listed at the bottom of this post or can be found on Meals Matter. Flipping through my parenting magazines, I can always find a fun design for a birthday cake. Even the most uncreative parents look to recipe books, bakeries or websites to find the cutest little cupcakes or designs to give their child a unique and special birthday treat. I’ve heard of parents spending hours learning to make fondant or dipping little cake balls into frosting in order to make the most perfect edible centerpiece. If only we’d put even a fraction of the effort into dinnertime. Sure, cake and other treats are almost universally accepted food, whereas broccoli is not. But taste is just one aspect of the eating experience. In fact, eating is one activity that engages pretty much all of our senses: taste of course, but also smell/aroma, touch (as in mouthfeel or texture of the food), sound (think of the crunch when you break that shell of a creme brulee), and sight. Ask any chef or restaurant owner, and they’ll tell you that the presentation of food is incredibly important. Of course those cakes taste good – they look pretty good, too! A common complaint I hear from parents of toddlers is how they can’t get their kids to eat anything healthy, that he or she will only eat certain foods and nothing else. But how can a slice of cheese compare to cheese-flavored crackers in cute little goldfish shapes? Or a slice of apple compete with chewy fruit-flavored snacks in the shape of cartoon characters? The trick is to make food fun for kids. Sure, we allow ourselves time to experiment with recipes for special occasions such as birthday parties, but getting artistic for dinnertime need not take any more time than assembling a regular dinner plate. Take, for example, the salads we make every night in my family. These are what my husband and I eat. Sure, eating dinner together and modeling healthy habits for our daughter certainly helped cultivate her love for carrots and bell peppers, but she also loves the fun plate we make for her. The Super Healthy Kids blog also has incredibly creative ideas and gorgeous pictures to help busy parents entice their children with healthy options. So please, stop sneaking in veggies and instead highlight them – make it fun. And don’t limit your artistic talents and food art for holidays and special occasions only. Be a little creative every day. Love the plate you give your daughter! Great point about putting just a little more effort in to dinner time. Love the “salad plate” for your daughter! I am having one of those Ah Ha moments as I read your blog. I am a veggie sneaker. Until now, I thought that was the best way. I love the idea of becoming a ‘highlighter’. 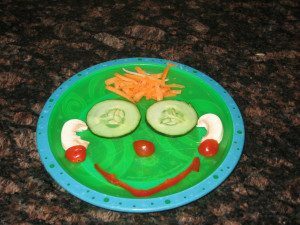 Smiley face salad on our menu for tonight. I would like to share some of your ideas on my blog if that is okay. I will link to your article. Of course! Glad you found the info useful. Good luck with your salad – let me know what your kiddo(s) think(s). Love your veggie face pic! I totally agree that by making vegetables fun is a great way to get little ones on board with eating them! Great blog post!! I love the plate you give to your daughter–we call that “deconstructing” around here!~! 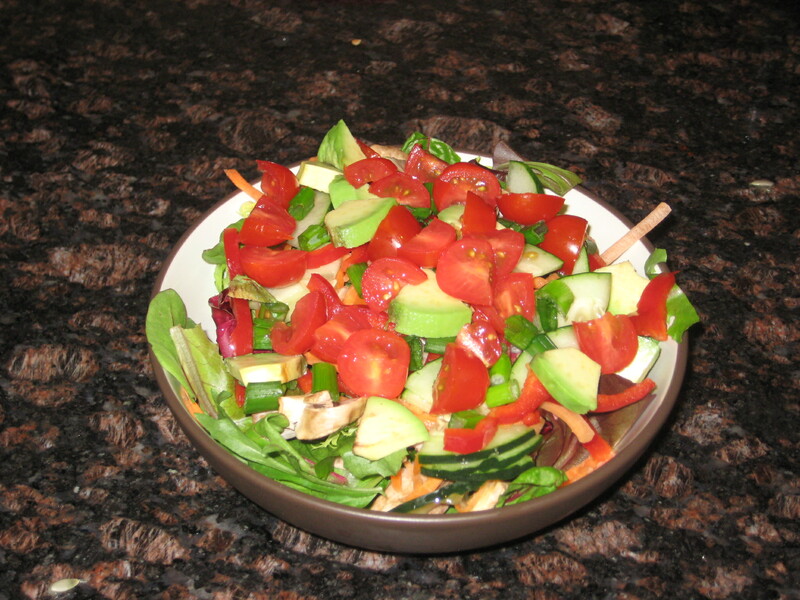 Highlight the veggies, don’t hide them…great advice that I whole-heartedly agree with! Hiding veggies undermines the trust a child has for his/her parent. Love the plate you give your daughter–I know for sure my kids would go for that too!